When a small crop of Roger Rabbit merchandise is released all at once, maybe there's a bigger meaning to it - maybe not. 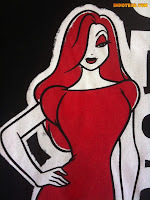 We'll get to that in another review - but the merchandise released was new shirts featuring Roger and Jessica Rabbit. 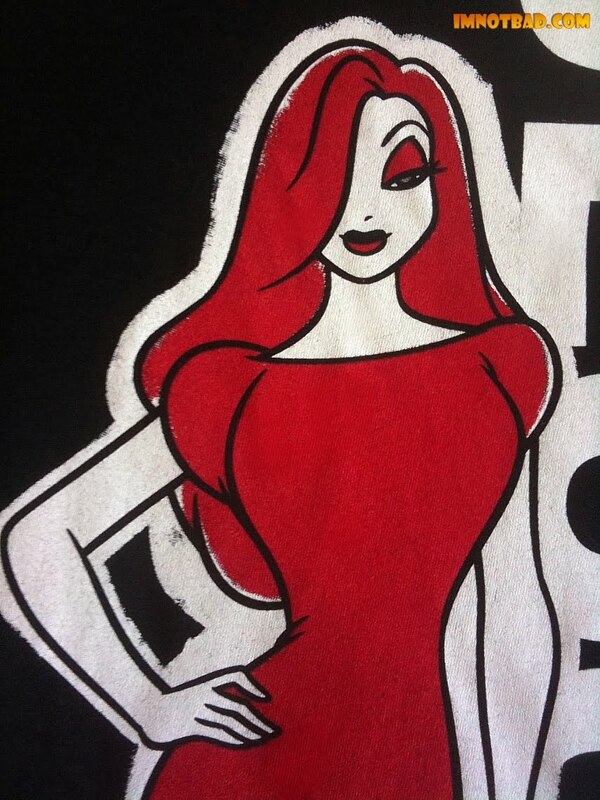 This shirt is the"casual" Jessica Rabbit shirt. Nicknamed so for Jessica's very new and relaxed look. This is a rather surprising look for Jessica, and the first time her image on a shirt has been so toned-down. There are only two colors used for the shirt - red and white. The shirt fabric is black. 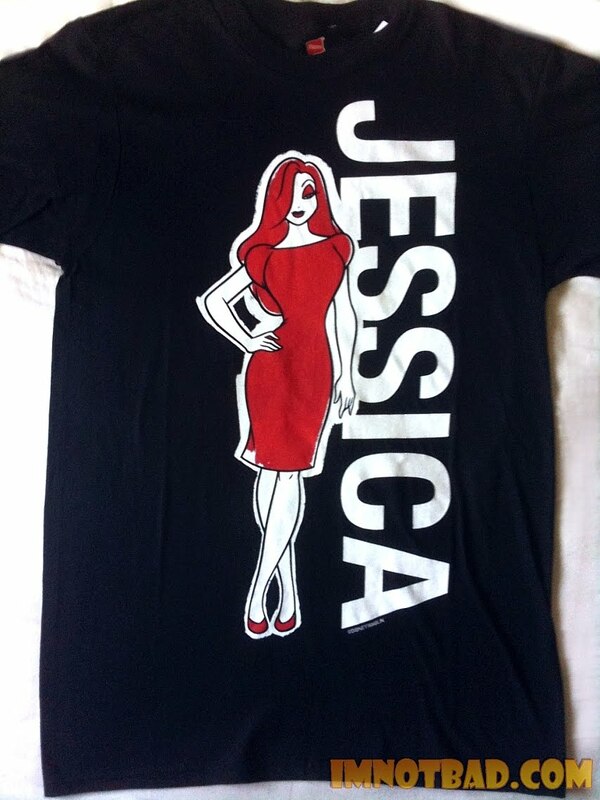 "JESSICA" is printed in big bold letters down the length of the left side of the shirt. There is a full picture of Jessica Rabbit standing next to that. Jessica is wearing a short red dress with puffed sleeves. The collar of her shirt is rather high up, and the length of the skirt ends just at the knees. She has one hand on her hip and has a very straightforward, model look about her. Jessica's hair, eyelid, lips, dress and shoes are colored red - which has a purposely unfinished look to it for an artistic flair. Her skin, and her name, are in white. She's lined in black and her eye is grey. Jessica also has a bold white boarder around her, and there is the Disney/Amblin stamp near her name. When first seeing this, I was not much excited about the look. Could Jessica have the same appeal being so covered up? The design has grown on me. Her dress is not too unlike one from the 1940's, so I think it is both appropriate and more kid-friendly for use on merchandise. Using only two tones works fine here as well. Though, I think this shirt is much more aimed at women (which is fine since her shirts are usually aimed at men), but could have benefitted from having a casual Roger next to her rather than a bold "Jessica". So while it took me some time to get used to the design, I'm still not over the fact that these are printed by Hanes - or on Hanes shirts - or whatever the case may be. 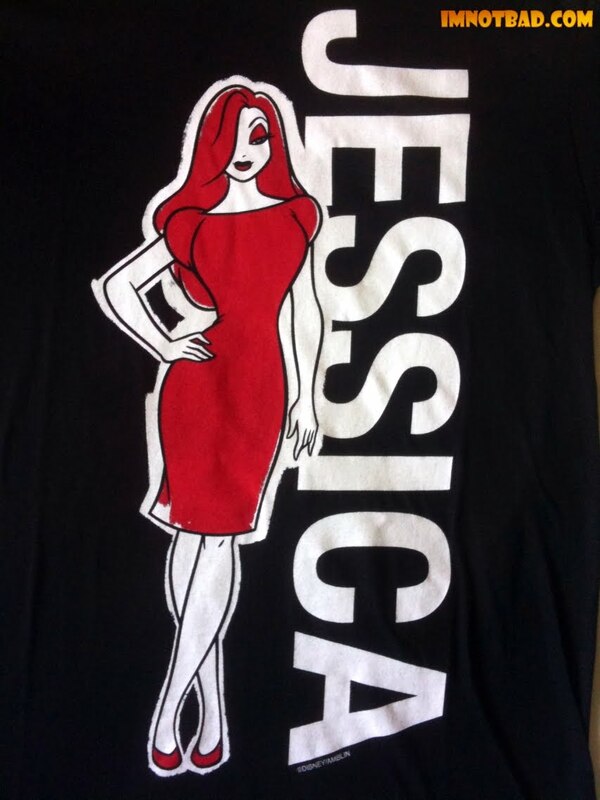 Again, like with the Jessica's Custom Speedshop shirt, the price tag of $24.95 is too high. The Hanes logo's are clearly printed on the inside collar of the shirt. 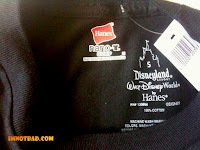 It was available at World of Disney stores in both Disneyland and Disney World. The Casual Jessica Shirt gets a 3½. It's nice to see some new artwork, though this is definitely a shirt more suited for women, and the price point is still too high for the quality of material it is printed on.